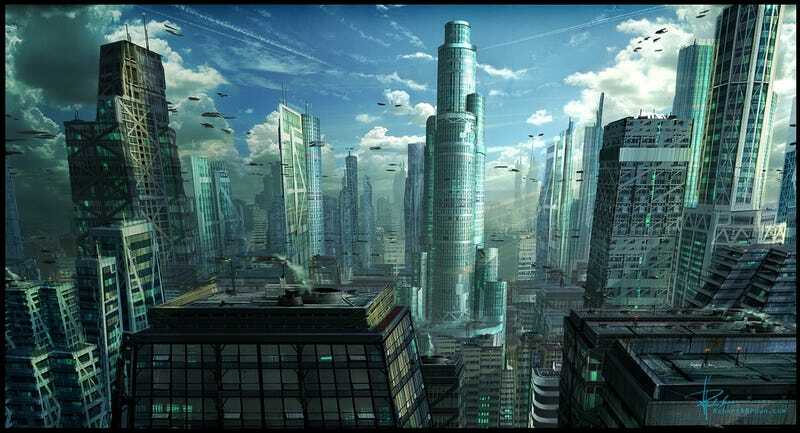 The cities of the future will be huge and super-dense — but will they also be alive? Could the increasingly complex systems needed to manage the next generation of megacities become our first true artificial intelligence? People have speculated before about the idea that the Internet might become self-aware and turn into the first "real" A.I., but could it be more likely to happen to cities, in which humans actually live and work and navigate, generating an even more chaotic system? The Internet Is Alive. Maybe. Prefab cities and arcologies: our future machine brains? As cities become more networked and their mixture of urban infrastructure and surveillance infrastructure becomes more complex, eventually we'll have to build cities that can think for themselves. People have speculated about the potential for computer systems to help in urban planning forever, including papers about the use of "fuzzy logic" to automate the decision-making process and A.I. solutions for land use planning, and the an A.I. "spatial decision support system." IBM's vision is to have a city's applications to talk to one another so that the city can be better managed. For example, buildings can be powered down or up as needed, and the cities can use their lighting and power systems more efficiently. The interconnected apps could also make cities safer. "By connecting and providing visibility into disparate systems, cities and buildings can operate like living organisms, sensing and responding quickly to potential problems before they occur to protect citizens, save resources and reduce energy consumption and carbon emissions," reads the invitation to IBM's PULSE 2010 event. Everything will be connected - buildings, cars, energy - everything. This is the tipping point. When we start building cities with technology in the infrastructure, it's beyond my imagination what that will enable. And given the prediction that China will need to build 221 cities, with over 1 million people each, by 2025, it's not hard to imagine each successive iteration of these highly networked "instant cities" becoming more sophisticated and more self-aware, as companies like Cisco create more and more of them. Another node of the coming urban machine mind could come from your devices as well as "smart" devices everywhere else. Urbanscale founder Adam Greenfield has written a lot about ubiquitous computing in urban environments, most notably in 2006's Everyware, which posits that computers will "effectively disappear" as objects around us become "smart" in ways that are nearly invisible to lay-people. In the more recent pamphlet Urban Computing and its Discontents, Greenfield and co-author Mark Shepard argue people's interactions with computers will become "socially integrated and spatially contingent, as everyday objects and spaces are linked through net-worked computing." It's inconceivable to me that cities of the developed world will not make use of the very extensive array of networked digital devices that will be present and available, whether it's to manage and optimize traffic flows, adjust building envelopes to present conditions, display current conditions of use, or, less happily, present tailored advertising just about anywhere. Could a billion urbanized human beings help to create a system so agile, it becomes a living mind in its own right? Imagine a machine consciousness trying to optimize garbage collection, recycling, electricity use, public transportation, parking, water and policing — to name just a few things? An A.I. that can figure out how to allocate parking spaces most efficiently using game theory — and figure out how to connect drivers looking for parking with available spaces — might require more and more creative algorithms, eventually leading to a fully self-aware city. Some futurists are still predicting that cities will become closer to arcologies — huge slabs of integrated urban life, like a whole city in a single block — as they grapple with the need to house so many people in an efficient fashion. The implications for heating and cooling an arcology, let alone dealing with waste disposal, are mind-boggling. Could a future arcology become our first machine mind? Cities and machine consciousness have been bound together in our minds, ever since the urban robot revolutionary of Fritz Lang's Metropolis. When Isaac Asimov wanted to flesh out his three laws of robotics, he created Robot City, an urban area composed entirely of robots. When we think of a world where humans and sentient machines live together, it's almost always a gleaming future city, like in Spielberg's and Kubrick's A.I. But also, whenever computers are called upon to create a virtual world in science fiction, they almost always create cities — everything from Tron City to The Matrix's mix of Sydney and Chicago, Mega City, to Caprica's New Cap City. Science fiction gives us the occasional virtual worlds that look rural — like Doctor Who's visions of life inside the Matrix, which mostly looks (not surprisingly) like a gravel quarry — but for the most part, virtual worlds are always urban. And Inception — which is essentially about artificial worlds created by networking people's sleeping brains, via a machine that's never really explained — gives us the first big example of a city moving in response to a person's consciousness, with its famous image of buildings folding over. The city itself becomes an extension of consciousness, which is one step closer to the idea of a conscious city. As Matt Jones pointed out in his fantastic post last year, comics are full of giant cities that are essentially alive. In particular, The Authority's Jack Hawksmoor was abducted and modified so that he's now linked to whatever city he finds himself in, and at one point he uses that ability to wear Tokyo like a concrete battlesuit, to fight against a rampaging, sentient Kansas City from the future. The Fantastic Four also comes across an artificially intelligent city in the Negative Zone at one point. And then there's the Doctor Who New Adventures novel Transit, by classic series writer Ben Aaronovich, in which an interplanetary train system, the Sol Transit System, has become self-aware. And there are a number of science fiction books featuring sentient cities, including Ian R. McLeod's Breathmoss And Other Exhalations. The main underlying idea is the attribution of experiences to instances of the Self, a fundamental aspect of human-like cognition... A unique feature of our approach is that we understand the Self as an idealized abstraction represented in the cognitive system rather than the system itself or any of its aspects: the body, the software, etc. Furthermore, this abstraction is never represented explicitly as a structure or a set of mechanisms. Their focus on selfhood is based on studies of "the human brain-mind," which place a greater importance on agency — a theory of mind which includes representations of one's self and allows for sustained attention to a task as well as initiative. Their approach uses schemas to represent knowledge and experiences, cognitive maps to organize those stored memories, and a model of "mental states" to represent the self. So here's why cities might have an edge over, say, the Internet as a whole, when it comes to developing self awareness. Because every city is different, and every city has its own identity and sense of self — and this informs everything from urban planning to the ways in which parking and electricity use are mapped out. The more sophisticated the integrated systems associated with a city become, the more they'll reflect the city's unique personality, and the more programmers will try to imbue their computers with a sense of this unique urban identity. And a sense of the city's history, and the ways in which the city has evolved and grown, will be important for a more sophisticated urban planning system to grasp the future — so it's very possible to imagine this leading to a sense of personal history, on the part of a computer that identifies with the city it helps to manage. Is this far-fetched? No more so than the idea of the internet itself "waking up," I think — it's hard to beat cities in terms of density, chaos, complex architecture and close involvement with the ultimate unpredictable variable: their inhabitants. If the ingredients for artificial intelligence turn out to be experience dealing with the quirks of humans en masse, as well as a certain awareness of self as a unique entity, then a future networked city might be a great candidate. So next time you're wandering around your city, looking up at the outcroppings of huge buildings, the wild tides of traffic and the frenzy of construction and demolition, don't just think of it as a place haunted by history. Try, instead, to imagine it coming to life in a new way, opening its millions of electronic eyes, and greeting you with the first gleaming of independent thought. Future city concept art by Robert D. Brown, via CG Hub.